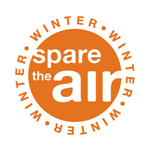 The Winter Spare the Air program notifies residents when particulate matter levels are anticipated to be unhealthy. On these high pollution days, the Air District will issue a Winter Spare the Air Alert which prohibits wood burning throughout the Bay Area. The Winter Spare the Air program notifies Bay Area residents when fine particulate, or soot, levels are anticipated to be unhealthy. In the wintertime, particulate matter — especially particulate matter 2.5 microns or smaller in size, also known as PM2.5 — can become a serious problem in the region. To protect public health, the Air District will issue a Winter Spare the Air Alert when PM2.5 concentrations are expected to be unhealthy. From November 1 through the end of February, under the Air District's wood-burning regulation, when a Winter Spare the Air Alert has been called, burning wood, firelogs, pellets, or any other solid fuels in your fireplace, woodstove, or other wood-burning device is illegal. When wood burning is allowed, residents who do burn in a fireplace or outdoor fire pit must still burn cleanly using dry, seasoned firewood, and not burn garbage, leaves or other material that would cause excessive smoke. Residents who exceed the excess visible smoke provision in the wood-burning rule could still be subject to a ticket. Follow these links for more information on the Air District's wood-burning regulation, and instructions on how to comply. You can also file a wood smoke complaint online. Residents and businesses can call 1-877-4NO-BURN (1-877-466-2876) to check the Winter Spare the Air Alert status and to report wood smoke concerns in their area. Residents can sign up to receive automatic phone alerts by calling 1-800-430-1515. Once you sign up, you will remain on the roster for subsequent Winter Spare the Air seasons. Residents can also sign up for EnviroFlash AirAlerts to receive e-mail notification when Winter Spare the Air Alerts are issued. Once you sign up, you will remain on the roster for subsequent Winter Spare the Air seasons. Up to $750 is available to replace non-EPA certified wood stoves with cleaner-burning equipment. For more information on this program, see this English fact sheet, this Spanish fact sheet or visit www.maringreenbuilding.org/woodsmoke. The nine counties that surround San Francisco Bay are home to almost seven million residents and an estimated 1.4 million fireplaces and woodstoves. Wood smoke continues to be a health concern in the Bay Area. Wood burning produces about one-third of the particulate pollution on a typical winter night. See the Spare the Air 2014-15, 2013-14, 2012-13, 2011-2012, 2010-2011, 2009-2010, 2007-2008, 2006-2007, 2005-2006, and 2004-2005 Winter Surveys of Bay Area residents. View historical "box scores" listing the number of times particulate matter standards have been exceeded on an annual basis in the Bay Area.